CORRECTED LINK - wild horse stuff - Deadline for the Virginia Range Wild Horses!!! Your Voice Will Count for These Horses! PLEASE NOTE THE EMAIL ADDRESS FOR THE NEVADA ATTORNEY GENERAL'S OFFICE HAS BEEN CORRECTED!!! WE APOLOGIZE FOR THE ERROR AND THANK YOU FOR YOUR PATIENCE! Thank you Amber DiLena Oberman for capturing the beauty and love of this little family of Virginia Range mustangs!!! Time is drawing near on the closing date for the Nevada Department of Agriculture's Request For Proposal (RFP) to Transfer Ownership of our precious and beloved Virginia Range wild ones! American Wild Horse Campaign has filed a law suit and requested an injunction to stop the RFP process. Your voice has played an incredibly important role in speaking for the horses. And it's important to remember that we need to keep up the pressure to make sure they know how we feel - angry at their actions and disappointed that they don't see the positive aspects for ALL of restarting a Cooperative Humane Management Agreement. On Tuesday, April 10, 2018, a representative of Hidden Valley Wild Horse Protection Fund hand delivered a letter to each member of the Nevada Board of Agriculture, the Nevada Attorney General Adam Laxalt (don't forget he is also running for Governor), the Nevada Deputy Attorney General Dennis Belcourt (the State's legal representative for the NDoA) and Nevada Governor Brian Sandoval. A copy of that letter can be read using the link below. We encourage you to read this letter and ask yourself if what the Board of Agriculture has done is acceptable to you? ….that when the Board of Agriculture members (who are all appointed by the Governor of Nevada) voted to direct the Nevada Department of Agriculture (NDoA) to put out a Request for Proposal to Transfer Ownership of the Virginia Range Estray horses, they essentially directed State Employees to create a situation, that when completed, will put a Third Party into the position of immediately breaking State Law? ….Nevada Revised Statute (NRS 568.340) says that it is unlawful for anyone to run their livestock on the "possessory claims of others"? Translation: It's illegal to run your livestock on someone else's private property without their permission/agreement. The Virginia Range is made up of THOUSANDS of parcels of mostly privately owned property. ….NRS Chapter 569 states the horses belong to the State, and the State is protected from liability with regard to where the horses are according to those laws? But that goes away if the State transfers ownership – the horses would become just privately owned livestock on someone else's land. This would mean that any Third Party group taking ownership of the Virginia Range wild horses would be in immediate violation of State Law as soon as the transfer of ownership is signed. ….that the Nevada Board and Commission Manual that directs the actions of State Board members, specifically defines the members as part of the Executive Branch of the Nevada government, a branch with the defined function of carrying out and enforcing in good faith Nevada State laws? ….that nowhere does it state Board members can choose which laws they care to enforce or carry out? Nor does it allow them to direct State Employees to knowingly create a situation that would, again, knowingly put a Third Party in the position of violating State law. ….that the Nevada Board and Commission Manual specifically says that "actions not taken in good faith may subject a Board or Commission, and even individual members, to liability"? ….that a Board member could be held personally liable for knowingly creating a situation that would cause someone to violate State law? ….that simply put, you could not buy a horse and just keep it on someone else's land without having an arrangement to do so? But that is exactly what this Board has told State employees to make happen. ACTION YOU SHOULD TAKE FOR THE HORSES! Please contact the people below and let them know that you expect State law to be upheld in good faith. Tell them you expect the RFP to be rescinded and you want the NDoA to meet with local advocates to create a better solution for the humane management of the Virginia Range wild horses through a cooperative agreement. Designate your correspondence as “Official Correspondence” so it will be retained and associated with this issue. THANK YOU FOR JOINING THIS FIGHT!!!!! 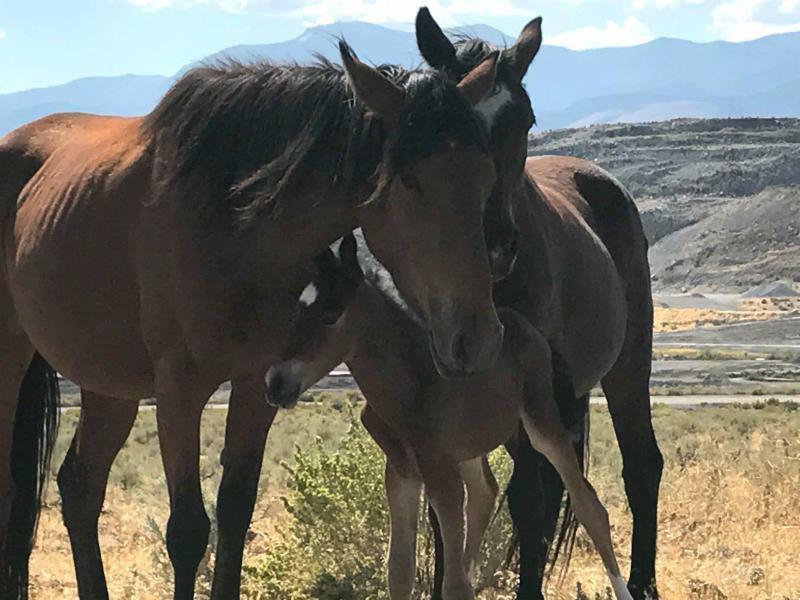 We at Hidden Valley Wild Horse Protection Fund remain tremendously grateful to all those who have taken an active voice and stood strong for these beautiful, gentle creatures who grace us with their presence, pride, and spirit. They inspire and bring great passion to those who have enjoyed them, on the range, at a distance. We will continue to fight for OUR horses, for YOUR horses. We will continue to protect our horses and ensure that they remain safe, on the range, wild and free, the way it should be, the way it will always be.